I hope everyone is having a wonderful April 1st. Last night I perusing a few blogs and noticed a fellow blogger had posted her Theme Reveal for the Blogging from A to Z Challenge. I had completely forgotten about. So, I spent the better half of the day deciding if I was going to join in the blogging fun and coming up with my calendar. What’s Blogging from A to Z? I quite simple really every day in the month of April, excluding Sundays, you blog your way through the alphabet. For the challenge, I decided to do a variety of posts from Reviews to Character Analyses to the I can’t wait to read. I’ve also included some of my favorite authors and books. 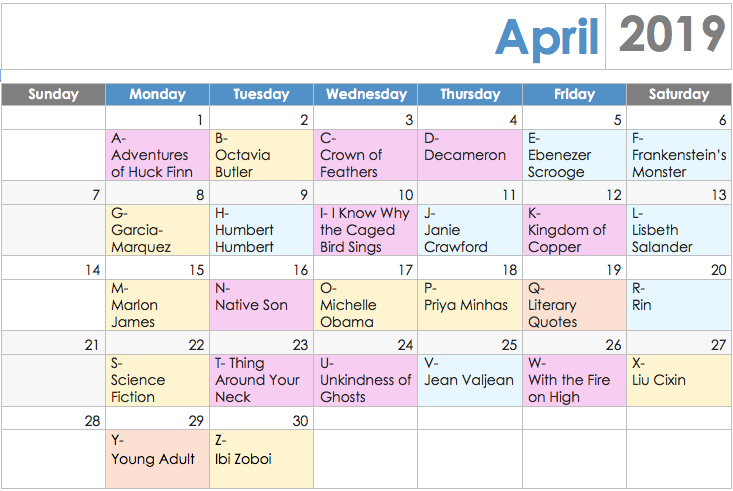 For your follow along pleasure, I’ve included the calendar for the month. This is so fun!!! Good luck, looking forward to reading all your thoughts!! Thanks and it really is quite fun. Oh. You will be covering Liu Cixin. I will definitely have to check back in for that one. I am a voracious reader also. My Goodreads shows that I have read 48 books already this year. I just can’t put them down. Ooooohhhhh, so tempting. April starts in less than two hours and I have to work a lot….but the temptation!